Stress fractures are common overuse injuries, and a calcaneus stress fracture is especially common in a runner or running athlete. Typically a runner with a calcaneus stress fracture will complain of pain that initially starts after a certain amount of running but gets better with rest. As the problem gets worse, he or she will have pain earlier in the run, and the pain will take longer to go away after the run. As it progresses to a stress reaction, or later a stress fracture, the pain will not go away with rest, and often the pain is present during activities of daily living, such as walking. A physician who examines a runner with a calcaneus stress fracture can usually reproduce pain along the heel. Unlike the pain with plantar fasciitis, which is typically on the sole of the foot at the heel, the pain with a calcaneus stress fracture is more spread out all along the heel. 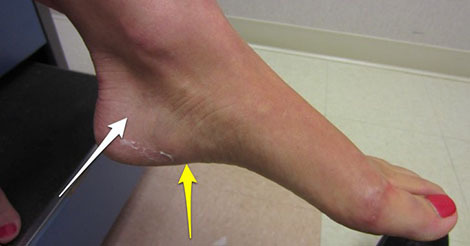 Typically the physician can squeeze the sides of the heel together and recreate the pain. Often x-rays will be enough to demonstrate a calcaneus stress fracture. If the physician is fairly certain that this is a stress fracture but the x-rays are negative, he or she might choose to order a bone scan or MRI. Treatment is almost always nonsurgical. Rest from running, wearing a walking boot or protective shoe, and often decreasing the patient’s weight-bearing status is usually sufficient to get the fracture to heal. The athlete is usually held out of running until the fracture heals. Then running is slowly reintroduced into the athlete’s training. While the fracture is healing, non-weight-bearing, non-impact activities such as swimming and stationary bike riding can be performed. There are usually no long-term consequences of this injury. It is important for someone who suffers a calcaneus stress fracture to consider a bone density study to evaluate for osteoporosis. Referral to a sports nutritionist to ensure that the athlete’s diet is providing sufficient calories, vitamins, and minerals is important as well.